Lock in a great price for Holiday Inn Cairns Harbourside – rated 8.5 by recent guests! The staff were very helpful, attentive, and kind. I was a single woman traveling alone and they helped me to book a snorkeling tour that suited my needs perfectly. The breakfast was also decent in comparison to the rest of the hotel. Good clean room and property, wide selection at breakfast. Location while it was nice that it was on the Esplanade, was a bit too far from downtown. The view was amazing! The wall of windows really enhanced the experience. The staff was very friendly and the room was very comfortable! Great beds and pillows. Staff were very friendly and helpful. Restaurant is great. The view is beautiful, the beds are comfy, the breakfast is good (especially the fresh fruits), the pool is great, the staff is awesome! Everything about this property was great. Amazing staff at check-in, (I forget his name but he was a younger but very helpful gentleman), comfortable bed, great pillows, very clean room, and the restaurant has great food. What more could you ask for? Will definitely stay here again if I ever find myself back in Cairns. Front office staff extremely friendly - cannot remember her name but a beautiful Lithuainian girl greeted us on arrival - she made us feel incredibly welcome. Loved the staff. Super helpful helping you getting in The best tours in town. The breakfast is great! Amazing selection. The restaurant had good service and affordable meals. An extremely soft bed which can be good for some but bad for me. Otherwise no problem. 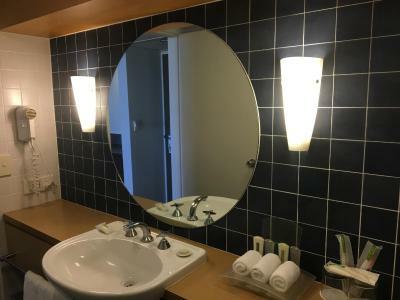 Holiday Inn Cairns Harbourside This rating is a reflection of how the property compares to the industry standard when it comes to price, facilities and services available. It's based on a self-evaluation by the property. Use this rating to help choose your stay! 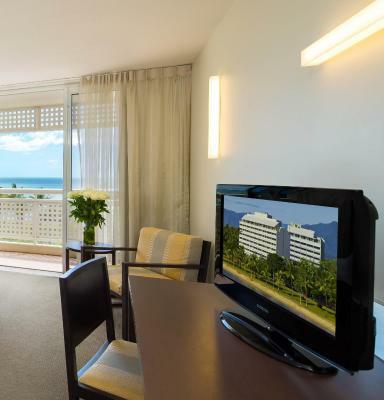 Located on The Esplanade, Holiday Inn Cairns offers rooms with stunning views of Trinity Bay or the surrounding mountains. Each room features a balcony. Holiday Inn Cairns is 10 minutes’ walk from the Tobruk Memorial Gardens. Cairns Convention Center and Cairns International Airport are each a 10-minute drive away. All air-conditioned rooms include a work desk, a TV, a mini-bar and tea/coffee making facilities. Guests can enjoy the sun on the terrace, or indulge in an in-room massage. 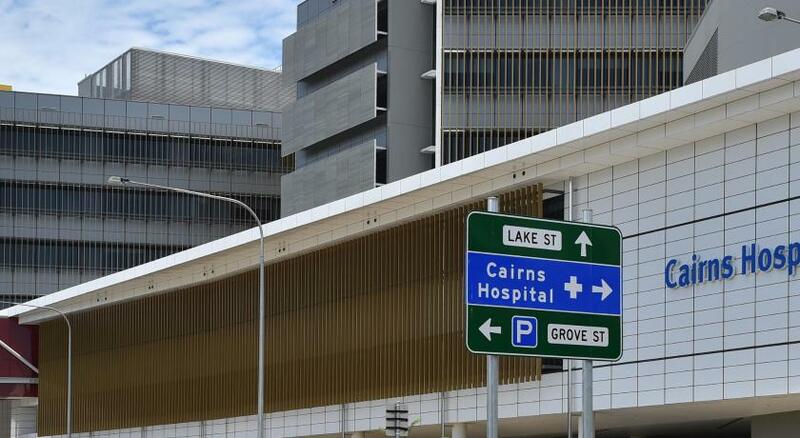 There is a 24-hour reception desk and a free hourly shuttle to the Cairns city center. Harborside Bar and Kitchen Restaurant features a poolside terrace, and serves contemporary cuisine with Asian influences. Overlooking Trinity Bay, Harborside Bar offers an extensive list of wines, beers and cocktails. When would you like to stay at Holiday Inn Cairns Harbourside? This suite features a balcony, seating area and flat-screen TV. House Rules Holiday Inn Cairns Harbourside takes special requests – add in the next step! Holiday Inn Cairns Harbourside accepts these cards and reserves the right to temporarily hold an amount prior to arrival. Close to where I wanted to be. THE BED WAS REALLY COMFORTABLE. STAFF WAS FANTASTIC, GIVE THEM A PAY RISE. Only one chair for the table. Comfy bed. Good size room. Tub could have been a tad cleaner, rest impeccable. Awesome staff - big shoutout to Dickie from the front desk who saved my day! Large comfortable room. Excellent shower and great view. Bed and pillow option nice touch.staff very helpful especially Dickie. Rooms and communal areas were a little dated. Not very stylish. The view but I had to upgrade for an ocean view room.